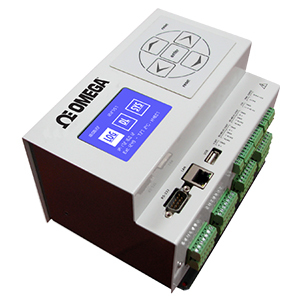 OM-240 is a versatile, high accuracy “smart” data acquisition system. It provides 24 differential analog inputs, individually configured. OM-240 Overview The Data Logger can be used in a wide range of applications, including HVAC, Oil and Gas, Water Quality, Energy and Building Monitoring. Using OM-240 requires no additional configuration/analysis software package, as it is provided by an Embedded Web Server. Only a standard Web Browser (Firefox recommended) for configurations and data view. Logged Data is ready to be shown in a graphic “real time” mode (License required) or exported in a CSV file. Channel expansion provided by multiplexers. There are 8 terminal blocks (each terminal block can handle up to 3 sensors). The OM-240 is designed to work with 2 to 6-wire sensors. You can connect 2-wire sensors on each channel and read 24 sensors, or 4-wire sensor and read 12 channels. The system will order sensors depending on how many wires they use, placing 6 wires sensors first, 4 wires in the middle, and 2 wires last. OM-240 Charting Once software configuration is done, clicking on “Wiring scheme” button on the web interface near the sensors will show how to connect the chosen sensor to the block physically. It shows “relative” position, so if you start connecting sensors from the first, you will not have to leave “unused” positions (except for the ground connection of every block, if not used). Multiplexers are needed if the total “wires” from sensors exceeds the 48 provided by the OM-240. Applications including Oil/Gas Pipeline Monitoring, Building/Bridge Structure Health Monitoring, Engine Thermal Mapping Testing, Data Center Environmental Monitoring, and Energy Farm Monitoring, and etc. Two opto-isolated digital inputs individually selectable for switch closure. Mechanical Endurance: 100 x 106 operations. Small backlight graphic LCD 128 x 64 dpi with membrane keyboard for the minimal local management without the PC. Keyboard for starting a data acquisition scan, sequential display of the last stored readings for each channel (sensor ID, converted unit reading, unit of measure), device status, data download and firmware/Web pages update by USB pen drive, safe mode (back-up/format/restore internal SD card). Voltage ‘V OUT’: Switched on and off under program control. V OUT is the unregulated input power supply ‘V IN’ (1 A). Power Supply Management: Always on or energy safe Every channel of each multiplexer board is completely independent. Note: Comes with Ethernet cable, USB thumb drive.